We have a new guest reviewer tonight, DanB, with a nifty review of what I'd consider vinyl. Tell us all about it, Dan! I noticed this line of figures at Toys R Us one day when I was browsing. I was immediately attracted to the very slick looking packaging. 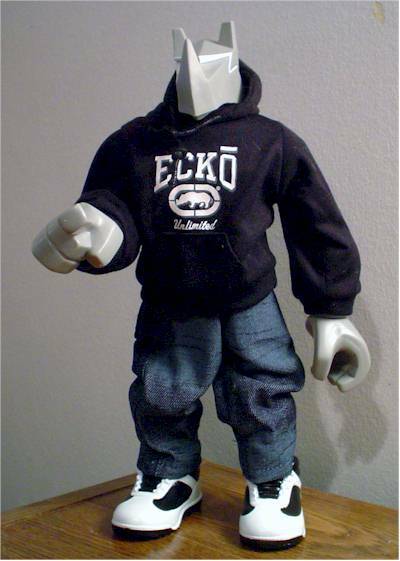 I am a fan of ecko clothing so I really liked this one over the others. 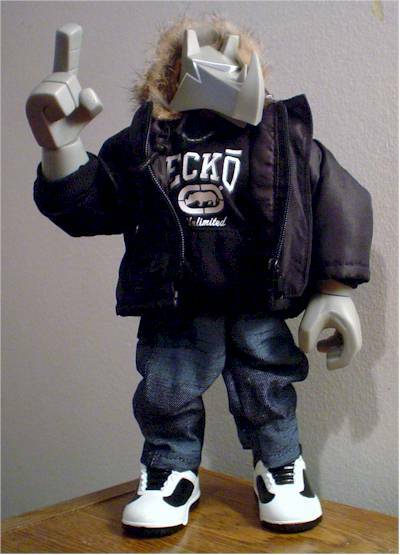 Ecko’s logo is a rhino so it makes sense to have a rhino figure. Some of the other companies had different figures that were more human looking. 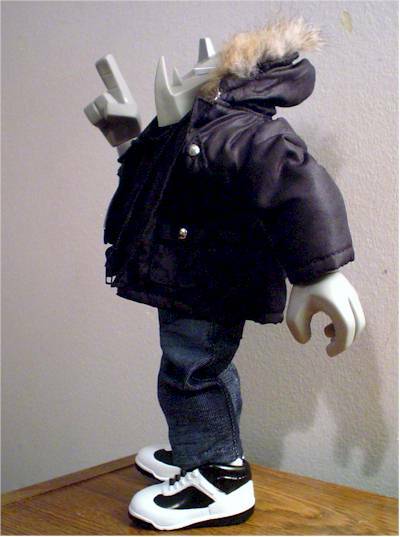 Basically this toy line is in conjunction with certain clothing companies to make displayable figures with a company logo plastered on them. If you like the particular company then it is pretty cool. I have never heard of this toy line before but it looks pretty good and you can find a decent level of clothing quality and color variation for each company’s figure. As I stated above the packaging is what caught my eye. It is a very urban looking metal “tin” with a large front window display. The rest of the box has a lot of graphics and I find it to be quite attractive and colorful. A “collector’s seal” is a plastic strip wrapping around the front held tight with a sticker. I found this to be fairly easy to remove and put back on if you want to make him look truly mint. The front lifts off and resting inside is a plastic tray with 3 twisty ties. Not too difficult to get him out. 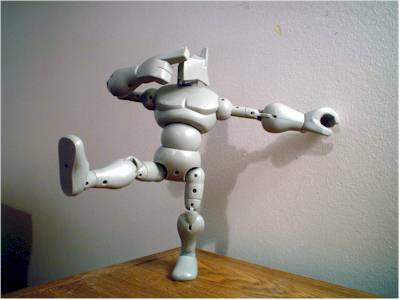 This figure is very stylized and blocky looking. There isn’t a great deal of detail here but all the lines are clean and well defined. One minor annoyance I noticed when I was removing his clothes to photograph him for this review is that he has a lot of holes for the screws that hold him together. If you wanted to display him shirtless it wouldn’t look very good but that isn’t the intent here. The hoody and parka are his best points anyway. This figure doesn’t have any accessories so he doesn’t need complex hands to hold them. On the right hand the finger is pointing straight out disco style and the other hand is partially closed. There are only two spots of paint here: his shoes and his eyes/cheek bones. The shoes are fine. I don’t notice any slop or bleed between the black and white really. The eye stripe across his face could be slightly more precise and considering it is his only paint really it should be perfect. I think this figure could have used a little more paint detail. It’s a blocky figure so it is hard to decide how much to put on. I would have preferred more paint on him because I like detail but it looks fine on the figure. It isn’t a major drawback. He doesn’t come with anything. A boom box, basketball, or spray paint can would have been applicable though and his hand is gripped to hold something. The hand should be more relaxed if he isn’t going to have an accessory. This is the coolest part of the entire figure. 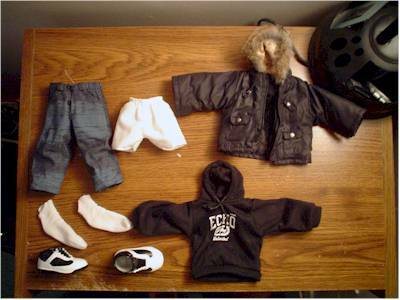 He has shoes, socks, jeans, boxer shorts, a hoody, and a parka. Some of the other figures had different clothing. 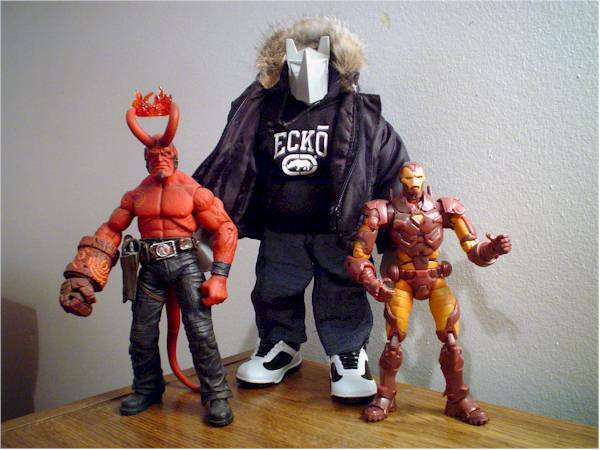 The other ecko figure I saw at TRU had a hoody and a messenger bag. The jeans are kind of bland and not that special as are the shoes and socks. I didn’t even know he had boxers until I took the pictures! The jacket looks excellent though. It has a working zipper, Velcro cuffs and fake hair around the hood. The hoody is equally as good. It fits very well and the printing on the chest looks excellent. The drawstrings are a little out of scale but they work. The pockets on the jacket are sewn shut but the pockets on the hoody and pants are open. The jeans have the fake wrinkled look that is so popular these days. I’m not a huge fan of it but this figure is supposed to be urban and it fits him just fine. Real shoelaces would have been a nice touch but that is my only real gripe. 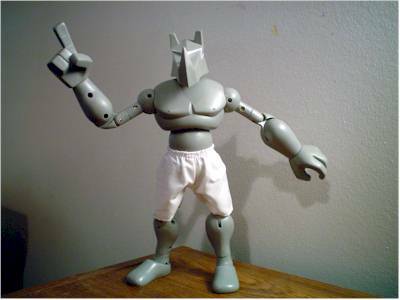 He has really good clothing and awesome articulation. He doesn’t have any small parts that can be lost either. I think kids might get a kick out of him. He’s held together with screws so he is pretty durable. I got this figure a few months ago but I recall paying $16 for him. A quick froogle search showed target has them for $20. $20 seems too expensive for them in my opinion. 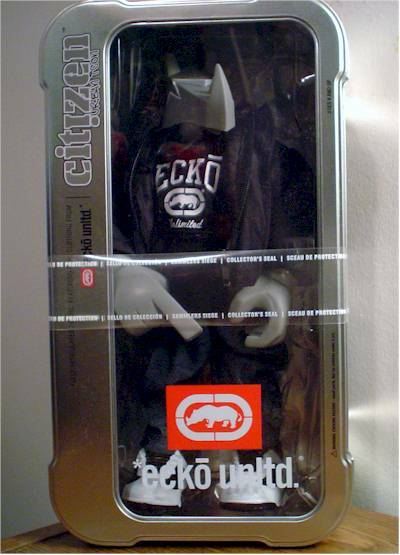 I bought this figure because I like ecko and the interesting packaging but I didn’t buy it JUST for the logo. A $16 price tag seems just fine, any more and I’d start taking some stars off. I was really impressed with this figure. It looks beautiful displayed on a shelf - in or out of the package. This figure really helps to show that the packaging can be an important part of the figure and a lot of companies out there could take a lesson from this line. My only gripe is the lack of any accessories. I’m not really too fond of the other clothing companies in this series so I won’t be getting the others but they are just as good from what I noticed in the store. Look out for any dings or scratches on the front window. It is a large window and while it is sturdy it’s still a plastic window and can suffer from shelf damage. Also make sure that the paint on the face is ok. Mine is pretty much fine but I could see how there could be some problems with slop or bleed. Check out the citizen urban icon site at www.urbanicon.net. The site is user friendly so you can easily find the other figures in the line and their variations. Figure from the collection of DanB.